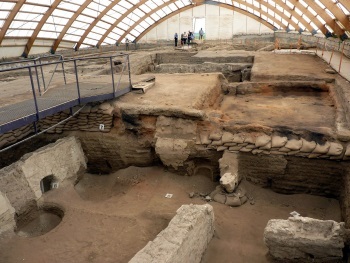 The Neolithic Site of Çatalhöyük consists of two tells with remains from the Neolithic and Chalcolithic periods. This was a large settelement, and the sites were permanently inhabited. Mud-brick houses have been found as well as wall paintings and other decorations. Burials were mostly beneath house floors. The site dates mainly from 7,400-5,500 BC. A wealth of goods and tools were excavated here, including stamp seals. The settlement was first excavated between 1961 and 1965. It has a unique level of preservation for a site of this age. The site has yielded significant artifacts and artistic work (particularly figurines. wall paintings, obsidian mirrors etc) but, understandably, these have been removed. The discoveries have also led to the development of a number of hypotheses about social organization and religion in the Neolithic age. The dig itself has adopted and developed new archaeological approaches and techniques Anyone interested in Catalhoyuk should really make sure that they visit the “Museum of Anatolian Civilisations” in Ankara where many of these are on show - and very fine they are! I personally would try to go there before seeing the site. At the entrance to the site (but outside the core zone) are an experimental reconstructed house with reconstructed decorations and artifacts and a small museum. I am pretty sure that all the articles in the latter are copies but it is an excellent display and should not be missed. The displays are in English and Turkish and appear to be something of a labour of love created by committed archaeologists working on the site. We only visited it after having seen the dig and I would suggest that it could be good to visit it (and the experimental house) both before and after. The site is in a very rural location around 40kms SE of Konya. We approached by car and I don’t know how easy it would be to get there by public transport . It might be worth mentioning that if you are driving west on the 330 towards Konya (we had previously visited the T List Caravanserai at Sultanhani and cut down to Karapinar) and want to take the minor road south to Cumra which leads to the site then it is not possible to turn left on the dual carriageway. Indeed the road is only signed going west and you will have to find a gap after a few kms and make a U turn! The site is situated “off a turning off a turning” but the route is quite well marked with UNESCO logo signs The area is very flat so the distant sight of a large mound would signal the site anyway – but its significance is enhanced by the presence of 2 large white plastic covered buildings at the top of the mound. These have been constructed to preserve the remains on the East mound and constitute the “North” and “South” shelters. A visit consists of a passage through the North shelter following a boardwalk, crossing the top of the mound and doing the same in the South shelter. There is also a “West mound” where digging is taking place but without a shelter - but there was no indication that this was open to visitors. Amazingly the site is free to enter! 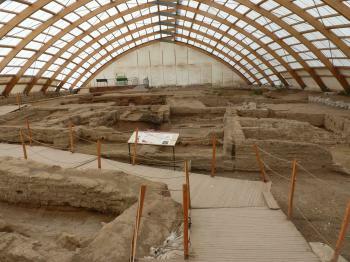 It seems to be run by the “Çatalhöyük Trust” which manages the archaeological work. A notice at the site entrance says that entry to the shelters must be accompanied by a guide. There only seemed to be one guy present who emerged from a “guard house”. He did walk around with a Turkish family which went up before us but let us do our own thing and there were very few other visitors. His English was very limited, but the site is well signed with boards at each significant point inside the shelters. There was no problem for us to return through both shelters for a “re-visit” rather than exit after the second. With the Museum and Experimental house we spent about 2 hours at the site. The guide also presented us with a copy of a nice little booklet in English produced by the Trust. It might be worth mentioning that, although the site is of course under control of the Turkish authorities, and involves researchers from Turkey and several universities around the World this dig has had and still has significant British input. The initial archaeologist in the 1950s and 60s and the man credited with its “discovery” was James Mellaart working for the British Institute of Archaeology in Ankara. A scandal regarding allegations of artifact smuggling led to his banning but some years later the dig was taken over by one of his pupils, one Ian Hodder, then of Cambridge. The on site guide indicated that, although Hodder is now at Stamford, he is still active at the site and Director of the “Çatalhöyük Project” whose objectives include investigating, preserving AND presenting the site to the public. Several British Universities are among the list of active organizations together with that of “Thames Water” among the list of sponsors! Former Largest Cities: with a good probability the worlds largest city around 7000 BC with an estimate of 5000-10000 inhabitants. 34 Community Members have visited.